A great deal of pressure was heaped on the young shoulders of Matt Biondi in the run up to the Seoul Olympics in 1988. He was one of the United States great hopes for multiple medals in the swimming pool. Comparisons were being drawn with the legendary Mark Spitz who had won seven golds in the 1972 games. 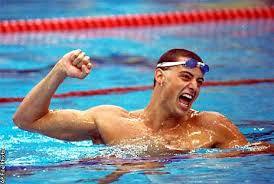 In his first event, the two-hundred-metre freestyle, he finished a creditable third. Great by most people’s standards, but disappointing for Biondi and the hard-to-please media back home. The next event was the one-hundred-metre butterfly. Having blasted into an early lead, and dominated the race all the way, he made an error of judgement on his final stroke. One more stroke squeezed in with a metre to go would have seen him home, but he chose to coast and stretch for the wall instead. In doing so he was pipped by a fingernail and beaten into second by an unknown swimmer, Anthony Nesty, from Surinam, not a country renowned for swimmers, let alone gold medals.